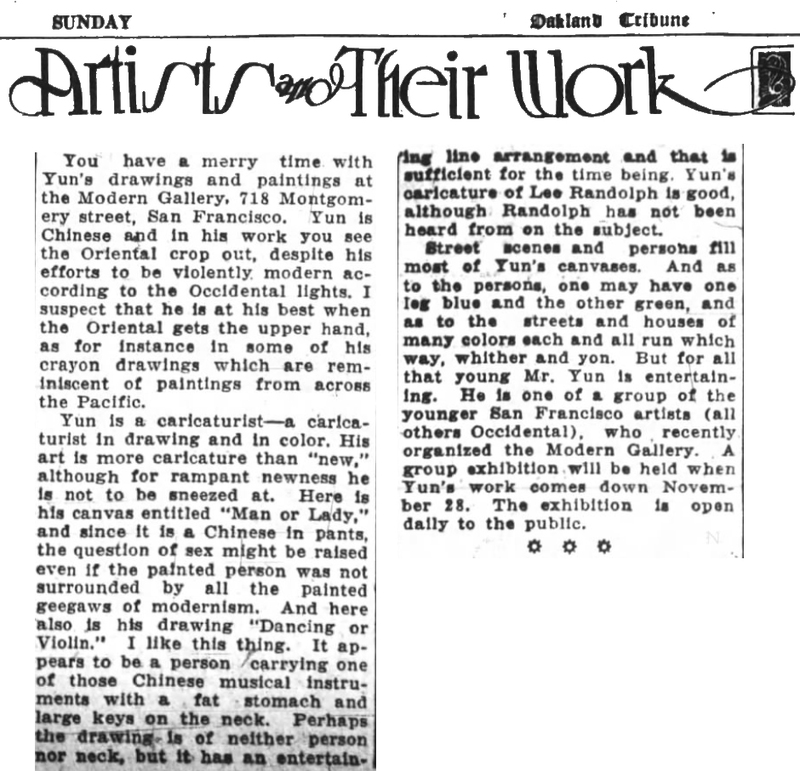 Less than a year ago the young artists of San Francisco established the Modern Gallery in Montgomery Street where, in what was once a livery stable, they showed their work and invited criticism and comment for their departures in artistic expression. 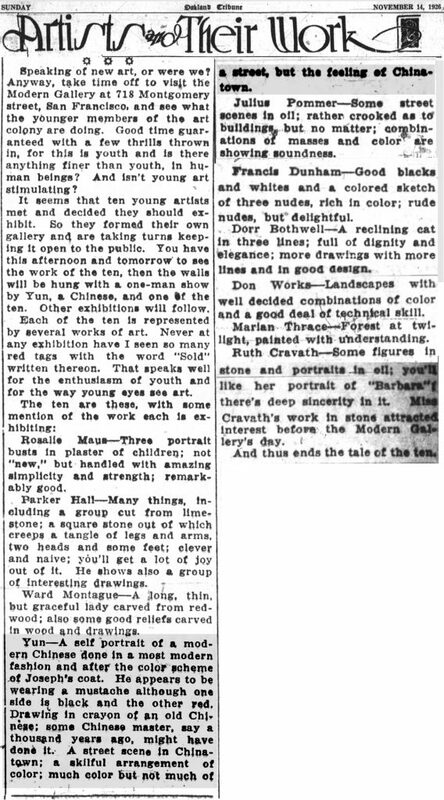 Now, ten months after their first appearance, we find four of the original group of “young moderns” exhibiting uptown in the East West Gallery of the Women’s Building, quite the most frequented show place in San Francisco. In this exhibit the work of Ruth Cravath, Parker L. Hall, Jacques Schnier and Ward Montague of the original Modern Gallery group is augmented by that of Enid Foster and Magnus A. Arnason. These six young artists, though known as sculptors, show paintings, wood carvings and line drawings as well as sculpture. A wide gamut of theme and treatment is ranged by the forty pieces shown but there is a bond of sympathetic outlook that makes the exhibit homogenous. As widely different things as Schnier’s “Marriage of Earth and Water” and Ward Montague’s “Lotus Flower” are the product of similar attitudes, the present day belief that the emotional concept must be intellectualized. So it is that we find representation dominated by abstraction even unto sophisticated naivete. Such is the “modernism” of the youth of today. Intellectual ghosts animating emotional form. Crystallizaitons of an introvert world. It is significant that four of this group now monopolizing the artistic spotlight are the same “youngsters” who defied fate and the public less than a year ago by opening a gallery dedicated to new experiments in art. Last November people went to the opening of the Modern Gallery with tongue distended cheeks, curios but unexpectant. They saw drawings, paintings, sculpture – all in unaccepted idioms. Some were susceptible to the novelty. A few saw beauty in the freshly cast concepts. Today the work of these artists and others of similar ideals not only attracts general attention but receives serious consideration as indicative of the new trend of artistic expression. Such sweeping acceptance was justified only by Labaudt’s explanation that he considered this phase of art the result of the application of the eternal laws of art to the mood of today. He insisted that the basic principles of art that has become classic and that which now seems strangely new are the same. In this sense the artists working in the present day idiom are not artistic holsheviks or revolutionists. it is only their means of expression that differs from that of the accepted old masters. The basis of true art remains the same. Art must ever be the safety valve of civilization and, as times and manners change, it is inevitable that the form of artistic expression shall change in both content and spirit while the underlying principles remain the same. So it is that this exhibit in the East West Gallery which has brought the “young moderns” uptown is not only an acknowledgement that the young artists have something to say but it is also evidence that the San Francisco art public is keenly responsive to new moods and messages.